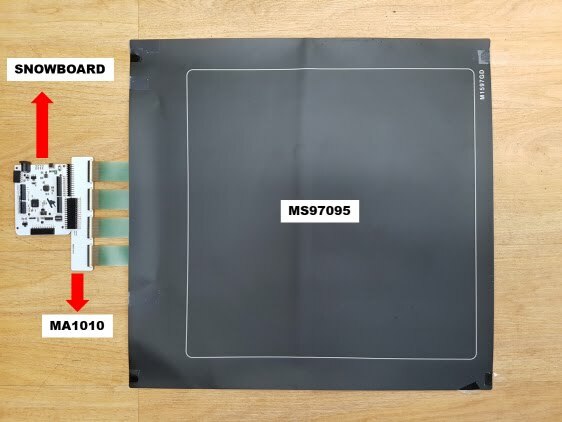 MS9705 and MS9717 is 48x48 channel large FSR matrix sensor. This sensor was originally designed for MC1509 force controller which supports this large matrix sensors. By the way, we have been received many requests from our customers to use this interesting sensor with our best selling Snowboard. So, we provide this step-by-step guide to use a Kitronyx' 48x48 channel FSR sensor with Snowboard. 4. Open Snowforce, click LOAD INI and choose snowboard_ma1010.ini. 5. click CHOOSE PORT and select an appropriate serial port assigned to your Snowboard. * Snowforce automatically lists available serial ports. 6. press 's' key to switch to 'square plot' mode. 7. That's all. Now you can see your foot print using Snowboard.